Every damn day I get this stuff. We’re going to start a new feature here on UltimateFatBurner.com entitled, “My Daily Spam”, where I post the supplement-hawking spam emails that clutter my email inbox every %#@$^! day. OK… I may not actually post these daily, as many of them feature the same products sold by the same people. But I will try to do so regularly. My inbox gets bombarded with this crap daily, and frankly, I’m tired of it. Spam is illegal and yet it continues to exist because it’s easier to delete it than actually do something about it. I’m as guilty of that as the next person. That stops now. 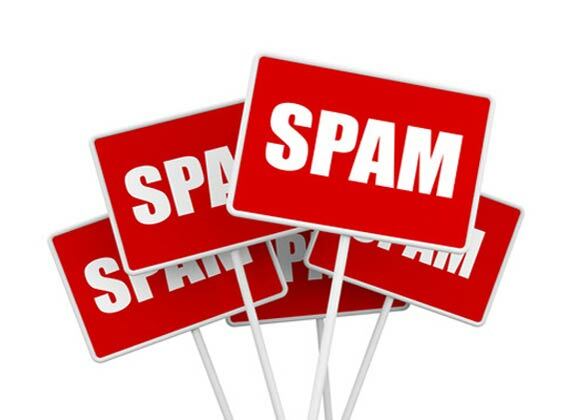 A tiny percentage of people still buy after clicking a link in a spam email. Yep, if sending spam wasn’t profitable, no one would send it. Hopefully, this new feature will draw attention to this fact and help reduce that number even further. In addition to sending spam, the retailers and / or their affiliates are using fake articles – the sort the FTC has already acted upon. Obviously, the FTC’s actions have had little effect. Maybe if we can expose more scammers to public scrutiny we can both increase awareness to this scam, and encourage more action from regulatory bodies. Some of this bad behaviour is no doubt undertaken by affiliates of the retailer, who may or may not be aware that their partners are engaged in such activity (this is entirely possible). In the case of credible retailers being promoted by unethical affiliates, we can help identify those folks. 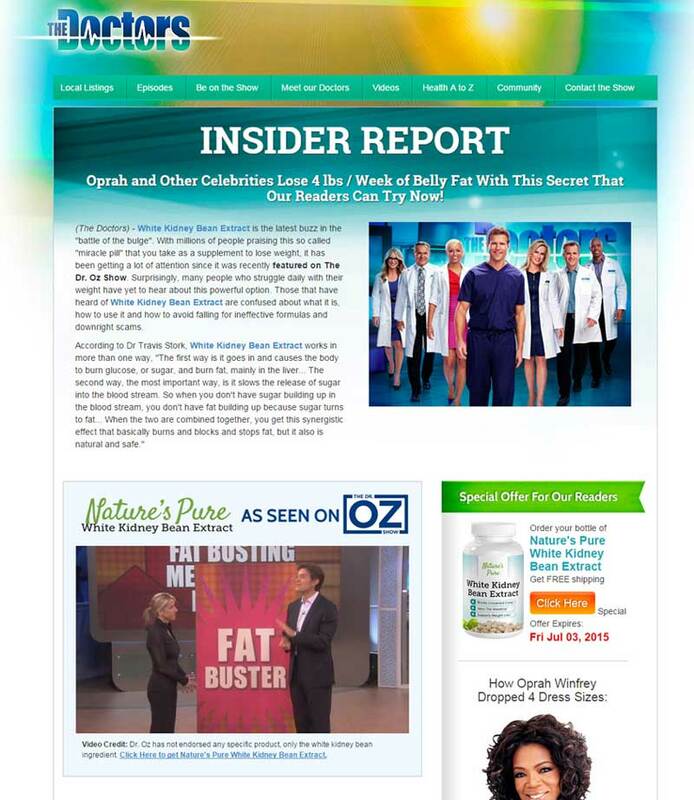 Today’s Spam: Oprah, The Doctors, and Dr Oz. This spam arrived in my inbox on June 29 (2015). It’s a doozy! One of the standard operating tactics for selling bogus, overpriced weight loss supplements is to claim a celebrity endorsement. 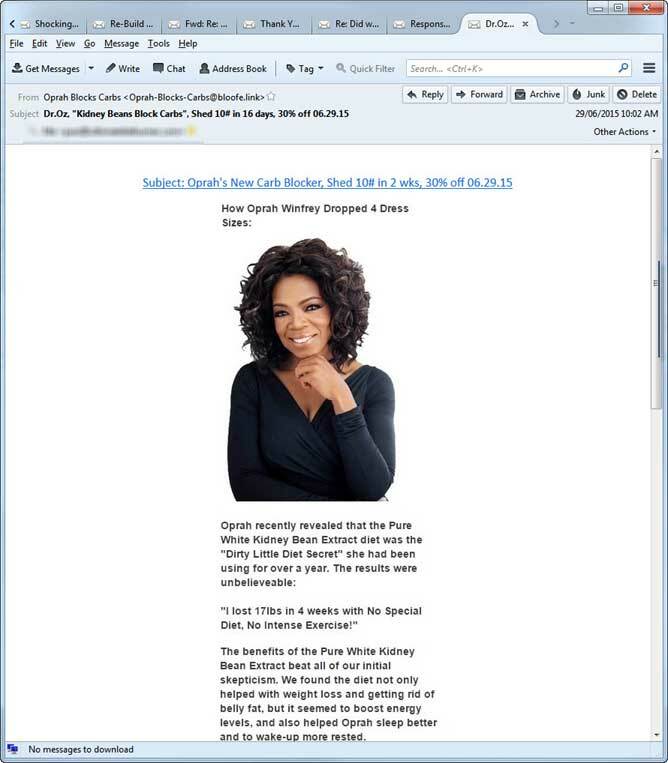 These guys haven’t stopped at one; they’ve used two; Dr. Oz (referenced in the email subject line) and Oprah! This arrived in my inbox, June 29, 2015. Because people expect to be “pitched” after clicking on an ad – and especially an ad in a piece of unsolicited bulk email – sending a prospect directly to a sales page would not result in many sales. The alternative, therefore, is to send them to a page that appears to be genuine – a source of real information, presented by credible people. Often, this page features celebrities, logos of national media outlets and/or popular television shows and looks like a magazine article (click here to learn more about how these scams operate!). But you could be forgiven for thinking so. The first thing you see is the logo for “The Doctors” – that popular television show that features doctors (big surprise, huh?) discussing supplements and what not. In fact, the entire top of the page mimicks certain elements of the official web site to the extent that if you have not visited it, you might think THIS is the official page. It’s not, of course, but the retailers of this product are hoping you don’t figure that out. Further down, there’s the usual ream of overly-enthusiastic testimonials and more “opportunities” for you to purchase. Since the scam is focused on white kidney bean extract, let’s talk about it for just a moment. Despite Dr. Oz and others going on about its near-miraculous powers, studies undertaken more than a decade ago did not show anything of the sort. And, a 2011 analysis of the clinical studies supporting white kidney bean concluded that the various human randomised clinical trials used to support its use suffered from so many methodological flaws that it was impossible to draw any “firm” conclusion on its effectiveness. Frankly, considering white kidney bean extract has been on the market for more than 10 years and we still have an obesity crisis is proof enough that this stuff isn’t exactly turning the tide. Like most weight loss supplements, it may help a tad, but it won’t make any dramatic changes to your waisteline. What to do About Spam? Fight Back! In the U.S., you can forward all your “unwanted or deceptive” emails to [email protected] (Click here to learn more about stopping spam. Tweet the FTC bigwigs and let them know. … to send a tweet to the commissioners Josh Wright, Edith Ramirez and Maureen Ohlhausen of the U.S. FTC. 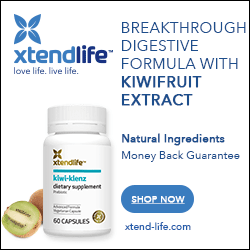 If this article interested you, you’ll love our article, “Dissecting the Ultimate Weight Loss Supplement Scam!.” It covers this scam in much greater detail.